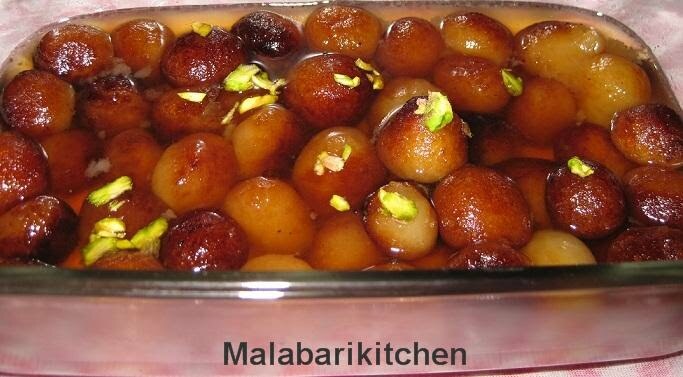 It is one of the famous Indian desserts made from dough consisting mainly of milk solids and flour in sugar syrup. Gulab Jamun powder is commercially available which makes it very easily prepareable. =►Take a vessel. Add ½ cup of milk powder, whole purpose flour and baking soda. =►Mix it well and make dough along with enough milk and melted butter. =►Keep aside the dough for 3-5 min. =►Make small dough balls like gooseberry shape. =►Heat oil in a pan and fry each dough balls very well. =►Make sugar syrup with 1cup of sugar, cardamom pods and water. =►Put all fried balls into the hot sugar syrup and decorate with cashews & pistachio. =►Leave it overnight to get best results. wooww wat a perfect gulab janum.. am sure it tasted great..